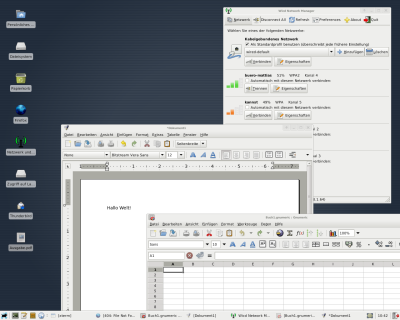 You probably noticed that LessLinux uses Gtk2 only. Even applications like Abiword, Gnumeric and some of the Gnome tools are older versions – some three years old, partially taken from Gnome 2.32. The background of this decision was to provide a persistent look and feel as well as to keep the size smaller. This is not suitable anymore. I had to decide between moving to the Mate libs or to Gtk 3. Mate is a fork of the last stable Gnome. This move would probably have given me some updated utilities and libraries but it would not have an provided newer applications like Brasero, Abiword or Gnumeric. So I decided to move to Gtk3. I already moved the easier to move applications like Zenity, Brasero, Abiword, Gnumeric and Evince. Wireshark and the likes will follow soon. Then I will provide images for testing. Afterwards, I will move Ruby-Gnome and the WX based apps like FileZilla and TrueCrypt to Gtk3. However, some Gtk2 programs will stay for a while: Firefox will keep Gtk2 as default for a while and XFCE will not move to Gtk3 in the upcoming version 4.12. At least a version of LessLinux Search and Rescue will be possible that uses Nautilus, Openbox and Midori that will be Gtk3 only. I just uploaded the first build containing linux kernel 3.8.0. Besides the new kernel, glibc got updated to 2.17. The most significant change is that now a (cross compiled) kernel for x86_64 is included. If necessary it will be accompagnied by a 64 bit busybox in one of the next builds. So currently three kernels are used: the 64 bit kernel, a kernel for 32 bit systems with PAE and a kernel for 32 bit systems without PAE. This number will be reduced to two as soon as the 64 bit kernel proves stable. Choosing the right kernel is (hopefully) done by syslinux’ ifcpu64.c32 module. To see which kernel was booted, run “uname -a” from a terminal. Please note that just the kernel is 64 bit, so chrooting to 64 bit linux environments should be possible now. Since I also plan to add EFI support with gummiboot we need a 64 bit kernel to be booted directly by the EFI loader (32 bit kernels will not boot on 64 bit EFI without intermediate loaders like GRUB). LessLinux now supports tracking of dependencies after building packages. This allows to define the order of packages to build. As a consequence of the dependency tracking it is now also possible to parallelize the build. On a three core Athlon this brought down build times from around three days to less than 20 hours. With a faster machine you should even get better results. mmmm is built around the XML output of lshw and uses just Ruby and Ruby/Gtk. No DBUS, HAL or Policy Kit required which makes it attractive for builds that try to be as light as possible. The interface of mmmm is clearly inspired by GtkMount of the Pmagic live distribution, but using the XML output of lshw is a bit more precise than just parsing “fdisk -l”. TODO: mmmm is very usable right now, but for the future a button to reread devices would be nice. Please test: Please test the latest build (lesslinux-20090604-1326) and tell me if mmmm correctly finds all your volumes. You might also send me your hardware information, so I can debug possible problems more easily. Update: A small bug in mmmm prevents extended partitions from being correctly detected. A fixed build lesslinux-20090608-1708 is available.